A general scale and clean is required once every six months, however some people with special conditions may need to see their dentist more often. Schedule an appointment to find out what’s best for you. If you notice any of these signs, contact us on 02 90512828 to schedule an appointment. 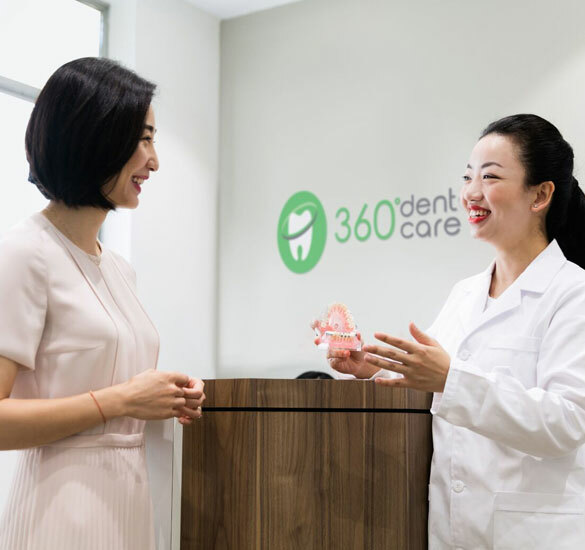 Where should I park my car when I come for my appointment at 360° Dental Care? There is ample street parking available in front of the clinic. X-rays allow the dentist to detect problems in areas not visible during visual examination, for example a cavity under an existing filling. During your first visit, we will conduct a general x-ray screening which needs to be updated annually or every two years. Will Medicare bulk bill dental treatments? We treat children of all ages. They should have regular check-up once their first baby tooth has come through. Our dentists are particularly good with children and will make them feel at ease. Yes, we open 9am – 5pm on both Saturday and Sunday to make sure we can treat any dental emergencies that may happen to you on weekends. When I get my teeth cleaned will they be whiter? The main benefit of cleaning is healthier gums. During the clean, your dentist will remove most of the surface stains on the teeth, such as cigarette stains. However, the internal colour of teeth would not be changed. You should consider tooth whitening procedures if you want further improvements. We offer a variety of ways to improve your smile, from bleaching to porcelain veneers. In as little as 60 minutes you can improve the colour of your teeth with Zoom in-office bleaching system. Ask one of our friendly staff which treatment is most suitable for you.